throw me over your shoulder. ‘You’ll maintain your composure when you’re in my enclosure. Three eyes to watch over all three worlds. And you do, always watching. ‘Salutations and prostrations’. I’ll sprinkle grains of worship unto thee. After all, that’s what you taught me. Three eyes over three worlds; its you who’ll preside. Cracking lighting clouds wide open as you wield your trident. Lord and father: disciplined, strident. He tramples where you tread. When you shout your charges scatter. Armed with blessings, tasting sweets from every platter. Loop your matted curls around me. Blow your fire into my bones. Come back here and watch over your stone! All-seeing, deluge over platteland. You flood our world with your presence. With those three eyes, what do you see? What do you see when you look at me? Master of this brick and mortar. Lavish me with your teachings. Talk to me like I’m your daughter. Why don’t you come and visit by me? You just stand outside and talk to that tree. Still, you must wipe your feet before you come inside here. I know you won’t stay for long. I pull the weeds and tend this garden on sunny days. Light the lamp and keep the windows shut. Maybe its good you’re going just now. No time to notice the cracks or smell on these moldy chairs. But there’s nothing on you. You’re always moving, heaving eager breathing. So you won’t catch on dust- not on that soft suede jacket. Better go now. Go on. You drank my tea; it wasn’t mine to serve. You bided your time. You sipped on mine. You like it?Here? This one here. Take some more for your flight back. She won’t mind or know. 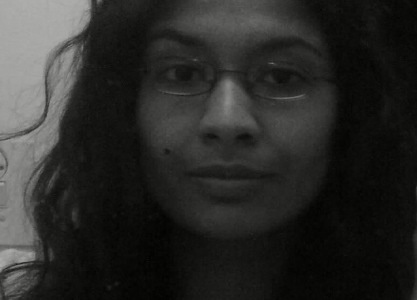 Sandhya was born on the North Coast of Kwa-Zulu Natal in 1987. She grew up in the quaint village of Seatides which is situated along the sugar-cane belt of the Tongaat district. As a child her irrepressible curiosity often resulted in painful consequences. She was not content with the banal knowledge that the switch turns on the light. No. She had to know how hot the bulb actually burnt. Fortunately this precocious, mischievous mind was soon harnessed by the creative outlets of poetry and short story writing. She matriculated from Seatides Combined School at the age of 16. After working an assortment of part-time jobs she moved to Cape Town to complete a diploma in Audio Engineering at the Cape Audio College. Since then Sandhya has completed a B.A. (Hons) degree in English Language and Literature Studies at the University of Cape Town. She has always written poetry, sometimes in secret, sometimes for the amusement of friends and family. Most often her cautious, quiet scribblings were the cathartic, emotional outpourings borne of personal trauma or victory. Now she writes outside of herself. Some of these latest poems form a triptych of sorts which probe and subvert idiosyncratic aspects of diasporic Indian culture. Persistent themes in these pieces include: the patriarchal appropriation of Hindu scriptural teachings, the conflation of fear and respect by young ones” towards “their elders”, and finally the preoccupation with masking familial discord and domestic abuse in order to keep up appearances within one’s community. Sandhya currently plans to forge links with local NGOs that share her vision for equitable access to tertiary education across the nation’s polarised socio-economic landscape.